Most of us have been mowing grass since we were old enough to push a lawn mower. Unfortunately though, that doesn't mean that we all do it the right way. 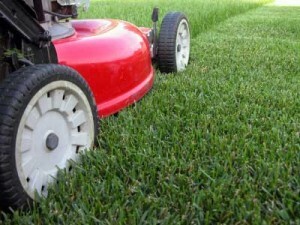 For instance, did you know that when mowing your grass, a dull mower blade will actually rip or tear the grass instead of giving it an even, clean cut? Don't worry, most people don't and because of that they're creating a breeding ground for disease and other lawn issues. At A Cut Above Lawn Service in Monument, CO we know what it takes to make a lawn beautiful. We understand that Monument can have long periods of dry weather which, if the grass is cut too short, can encourage weed growth and heat stress or, as before, makes your lawn susceptible to disease and/or insects. Injury to the crown, the part of the blade of grass that stores nutrients and generates new growth. More susceptible to insects and disease. Not enough surface area to encourage proper photosynthesis. Creates more sunlight for weed seeds to germinate. There are more reasons, of course, but as a professional lawn service in Monument, CO we pay particular attention to the 1/3 rule. Which is why you will see us adjusting blade depth before mowing your grass... each and every time. Give us a call, we'd love to be your partner in creating a healthier, more beautiful lawn.